Marcy is a white female with black spots that is a very special girl. She has an esophogeal disorder that caused her to throw up when she ate, so she was very tiny and the runt of the litter. She barely survived. Eventually her owner figured out why she was so thin and smaller than her littermates. Marcy had to be fed separately out of a raised feeder and needed softened food that was easy to swallow to keep from choking on it. Her racing owner hoped she would eventually grow out of the problem as she got older, but she didn't. Marcy never raced because of her issue. Her racing owner didn't think that anyone would want to adopt a girl that had this disorder, so just planned to keep her on the farm as a pet for her whole life. We know there is a special family out there for Marcy, in spite of her disorder. We have placed other dogs with the same problem. 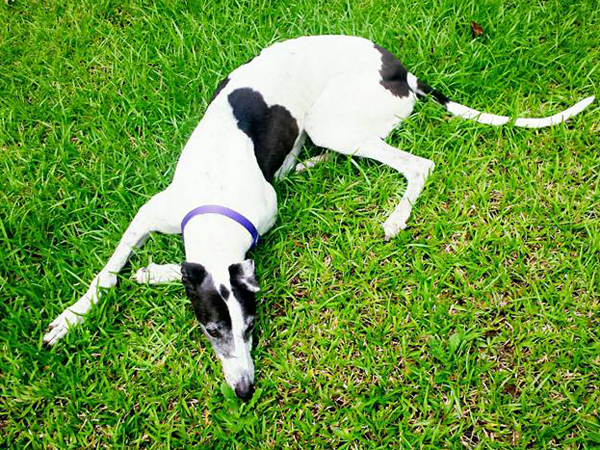 Although Marcy is small for a female greyhound, she is healthy. As you can see from the photos she is able to maintain a good weight using the raised feeder and making sure her food is very soft. She does need to be walked on a harness instead of using a collar to avoid pressure on her esophagus but that is her main limitation. Marcy is a sweet, friendly girl that loves everyone she meets. She turned 7 on April 20th. Her sire is Ardkill Jamie and her dam is JT's Petey Girl. We placed her littermate Hanks Luckycharm and DDM's Dynamite years ago. Marcy is very well behaved in a house and very quiet in her crate so may be a good choice for an apartment. She passed her cat and small dog tests so should be fine to live with either. Be sure to look at Marcy's other photos to see pictures of her as a puppy. She is the tiny one in the group. Marcy has been fostered with kids and cats and is great with both. She is a snuggler that likes to be as close as possible. She loves to cuddle in bed with her foster family- kids and adults. Although she would like to be up on the couch with her family, she doesn't like her feet going between the cushions on the couch. So she figured out that sleeping on the ottoman was a better place for her. Marcy has been in an adoptive home but was unable to hold her pee all day while they worked. They think she would do better in a home where people weren't gone all day. We are getting her checked for a urinary tract infection, since she didn't have this problem in her previous foster homes. Marcy was adopted by a wonderful family and suddenly passed away in July of 2018 due to some internal bleeding that couldn't be fixed. Rest in Peace sweet girl!